Background: Design of novel PPAR-γ modulators with better binding efficiency and fewer side effects to treat type 2 diabetes is still a challenge for medicinal chemists. Cost and time efficient computational methods have presently become an integral part of research in nuclear receptors and their ligands, enabling hit to lead identification and lead optimization. 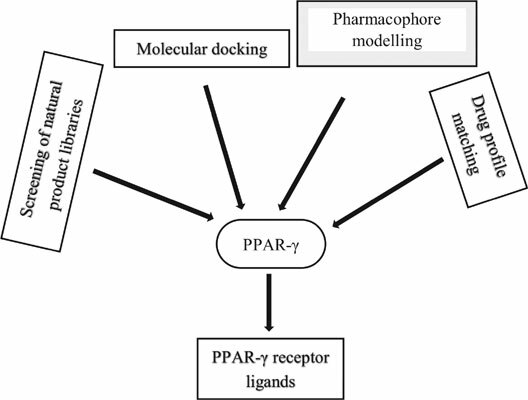 This review will focus on cutting-edge technologies used in most recent studies on the design of PPAR- γ agonists and will discuss the chemistry of few molecules which emerged successful. Methods: Literature review was carried out in google scholar using customized search from 2011- 2017. Computer-aided design methods presented in this article were used as search terms to retrieve corresponding literature. Results: Virtual screening of natural product libraries is an effective strategy to harness nature as the source of ligands for PPARs. Rigid and induced fit docking and core hopping approach in docking are rapid screening methods to predict the PPAR- γ and PPAR-α/ γ dual agonistic activity. Onedimensional drug profile matching is one of the recent virtual screening methods by which an antiprotozoal drug, Nitazoxanide was identified as a PPAR- γ agonist. Conclusion: It is concluded that to achieve a convincing and reliable design of PPAR-γ agonist by virtual screening techniques, customized workflow comprising of appropriate models is essential in which methods may be applied either sequentially or simultaneously. Virtual screening, PPAR- γ agonists, type 2 diabetes, natural product ligands, pharmacophore modelling, docking, core hopping, drug profile matching.